Though their history is much longer, since the uprisings and protests of 2011, protest camps have gained prominence in waves of contentious politics, deployed by movements with a wide array of demands for social change. Whether erected in a park in Istanbul or a street in Mexico City, the significance of political encampments rests in their position as distinctive material and mediated spaces where people come together to imagine alternative worlds and articulate contentious politics, often in confrontation with the state. A key uniting feature of many protest camps and other place-based protests is the politicisation of care. In recent years new protest camps have often addressed unfolding crises of social reproduction, such as housing, but also addressed specifically the threats to life emerging from the continuous exploitation of natural resources. Protest camps form the site of contestation, but they also provide places in which sustainable and resilient alternatives are experimented with, created, and practiced. This panel brings together scholarship on protest camps and place-based, ongoing protest in all their varied manifestations. Our argument that protest camps cut across social movements is not a structuralist one, instead, it is as an orientation to an understudied practice enacted within many social movements. Our objective, then, is to extract protest camps from their silo-ed location within specific movements and consider the relations, connections, similarities and differences in their forms across time and space. 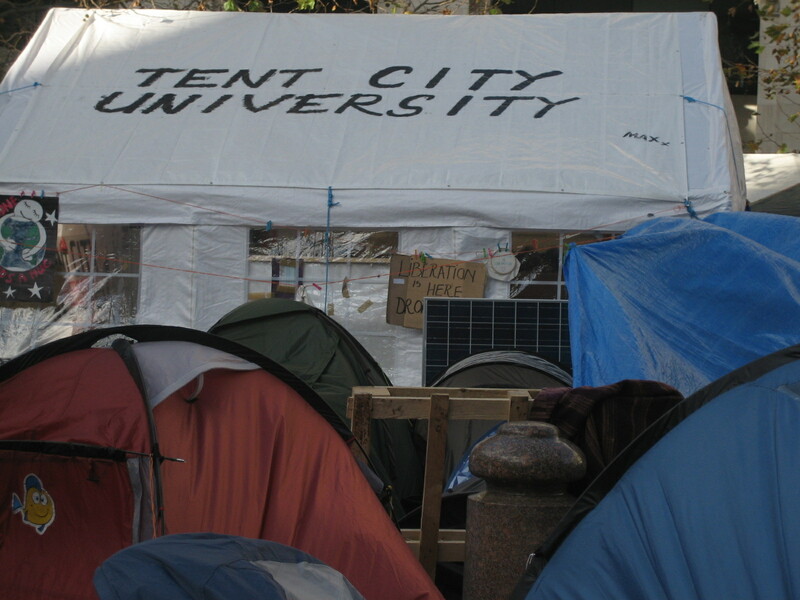 In recent years, new scholarship on protest camps has appeared, mainly driven by reflections on the Arab Spring (Gerbaudo 2012; Ramadan 2013), M15 (Castañeda 2012), and Occupy (Juris 2012; Kidd, 2014; Pickerill and Krinsky, 2012), either individually, or as linked phenomena (Feigenbaum et al 2013; Frenzel et al 2014). There has also been work that draws comparisons between the strategic and tactical functions of past and present protest camps (Leidinger 2011, 2015). Recently, new protest camps and place-based protest have also emerged, as capital-led globalisation continues to undermine the social and ecological basis of human society. In Northern America, coalitions of indigenous land right activists and climate change protestors utilise land occupations to challenge the expansion of settler societies land grabs, often for the purpose of resource extraction. Global migrant mobilities challenge border regimes globally, claiming the human right of freedom of movement and a world without borders. In migrant struggles, autonomous camps set up by migrant activists, as seen in Calais, have become key infrastructures, providing shelter and political bargaining power, as well as enabling the politicisation of migrant solidarity. Challenging the failure of housing provision in global capital-led real estate regimes, people have organised themselves in tent cities and occupied disused buildings. Under precarious conditions facing repression and discrimination, tent cities provide shelter, protection and organising spaces for challenges to the status quo. Example such as the tiny house movement show attempts to develop a new politics of autonomous housing. This panel reflects on shared challenges across different movements and approaches to studying protest camps and place-based, on-going protests. It brings together case studies, as well as to identify ways in which research in this field can be further connected. We are interested in both materialist perspectives that focus on protest infrastructures, as well as alternative conceptual readings of protest camps. In particular, we are interested in questions of social reproduction, power, and the politics of care as they play out in these unique social movement settings. We invite activists and scholars from a broad range of disciplinary backgrounds to present their empirical and conceptual work on protest camps, tent cities, refugee camps, squats and related place-based, on-going sites of protest. We invite 10 minute inputs, rather than full papers, to enable plenty discussion time. Presenting at the panel, per AAG policy, does not conflict with presenting a paper at another session. If you are interested in contributing to this panel, please send a brief outline of what you would like to talk about to Fabian Frenzel at ff48 (at) le.ac.uk by 15 October 2016. This entry was posted in occupy, protest camps, protest camps, Workshop. Bookmark the permalink.